Petty Officer 3rd Class Kenneth A. Smith. Condolences came in spades on Thursday as the U.S. Navy confirmed the death of a Cherry Hill resident who was among the 10 missing sailors and five other crew members lost in Monday's collision between a destroyer and an oil tanker off the coast of Singapore. The remains of Kenneth Aaron Smith, 22, were identified by Navy officials called off a sea search covering 2,100 square miles. 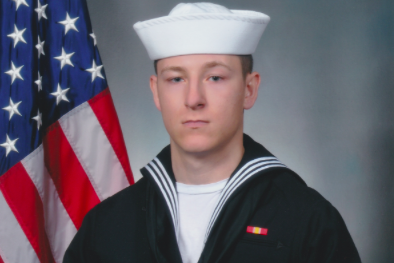 Smith was an electronics technician 3rd class aboard the USS John McCain, a guided missile destroyer whose hull was ripped open after colliding with the merchant vessel Alnic MC. A Michigan native, Smith moved to Norfolk, Virginia, to live with his father as a teenager and later settled in Cherry Hill, enlisting in the Navy in 2014, the Virginian-Pilot reported Thursday. "Kenneth was a great young man, son, and Sailor. He truly loved his family, the Navy, and his shipmates. I am incredibly proud of his service to our country. He will be greatly missed and I am thankful we had 22 wonderful years together. Most important we ask you to keep in your thoughts and prayers all the families and friends of those affected by this tragedy. As you can imagine, this is a very difficult time for our family and I respectfully request that you allow us to grieve in private." Smith's mother, April Brandon, had posted on Facebook earlier this week with hope for her son's recovery. Comments on Thursday showed support for the grieving mother, who lives in Milford, Michigan. A candlelight vigil reportedly was held at her home Wednesday night. "We pray that God is with you and your family at this time and always," wrote one commenter. "Sorry for your loss." Politicians and leaders in New Jersey shared their sadness and gratitude for Smith's service on Thursday. “On behalf of the entire Camden County Freeholder Board, I wish to extend our most sincere and heartfelt condolences to the family of Kenneth Smith who proudly served his country aboard the USS John S. McCain," Freeholder Bill Moen said. "As I have said previously, his commitment to become a third-generation sailor, following in the footsteps of his father and grandfather before him, is truly inspirational, and he exemplifies a life of service to others." “Let us honor Kenneth’s bravery by reflecting on his commitment to the nation he loved, his unwavering patriotism and the profound debt of gratitude we owe him and his family for their sacrifice," added U.S. Sen. Cory Booker. An 80-hour sea search for survivors and remains was assisted by aircraft and ships from Malaysia, Indonesia and Australia. Navy divers will continue to search flooded compartments inside the USS John McCain for the remains of those who are still officially considered missing. In response to Monday's collision, the fourth this year involving a U.S. Navy vessel, Vice Adm. Joseph Aucoin, commander of the 7th Fleet, was dismissed for operational reasons. An operation pause has been placed in effect for Navy fleets around the world to ensure the safety and effectiveness of operations. Four sailors who were injured in the crash have been released from the hospital after receiving treatment in Singapore.